In January 2006, I was contacted by a producer, Diana Muir, from Real Life Media Productions regarding an upcoming film about the Mary Celeste they were making for UK Channel Five, one of the main UK terrestial broadcasters. I spent around 40 minutes on the phone, at my expense, explaining why an explosion or fire in the cargo was possible and how it could have happened without leaving a trace. My experience of alcohol fires is based on practical experiments in the garden, and small fires in the laboratory as a chemistry undergraduate. Do not try these things at home, it can be seriously dangerous. Unlike David Williams, who was offered money for the use of his seaquake theory, there was simply the promise of a mention in the credits, which did not, in practice, materialise. The programme, which aired on Wednesday 24th May 2006, 8.00pm as part of the 'Revealed' series which promised: "new and baffling insights into what seem, on the surface, to be familiar stories." It was later shown on the Discovery Channel. The documentary largely followed the story on this website, and included footage of a similar ship and reconstructions of events, with details of the seaquake theory without a mention of its source, and a practical demonstration of a scale model explosion conducted by Dr Andrea Sella, an inorganic chemist at University College London (UCL), which was also not mentioned in the credits. It also featured interviews with a number of 'experts', including Brian Hicks, author of the book 'Ghost Ship', who said that the cargo was methanol. This is toxic and the purpose of shipping the alcohol across the world was to fortify wine, it was loaded from a bonded store, so he really should know better. The demonstation of a scale model explosion was valuable, albeit it was more of a visual effect than a serious study. It did not actually use alcohol. The similarity between the demonstration model and the hold of a ship is obvious. However, the observations are quite reasonable. Dr Andrea Sella built a replica of the hold of the Mary Celeste. Using butane gas, he simulated an explosion caused by alcohol leaking from the ship’s cargo. Instead of wooden barrels, he used cubes of paper. 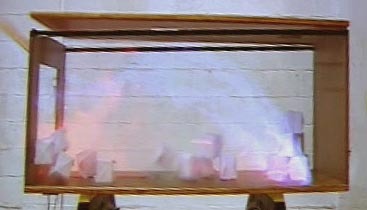 Setting light to the gas caused a huge blast, which sent a ball of flame upwards. Surely the paper cubes would be burned or blackened or the replica hold damaged. Remarkably, neither happened. "What we created was a pressure-wave type of explosion," says Dr Sella. "There was a spectacular wave of flame but, behind it, was relatively cool air. No soot was left behind and there was no burning or scorching. Given all the facts we have, this replicates conditions on board the Mary Celeste. The explosion would have been enough to blow open the hatches and would have been completely terrifying for everyone on board." A real explosion could have been triggered by a spark caused when two loose barrels rubbed together, or when a careless crew man, pipe in mouth, opened a hatch to ventilate the hold during the long crossing from New York to Italy. Records show that 300 gallons of alcohol had leaked – more than enough to create a terrifying explosion. "It is the most compelling explanation,” says Dr Sella. “Of all those suggested, it fits the facts best and explains why they were so keen to get off the ship."